This imposing vase with its archaistic bronze-style decoration and glaze coloured to suggest the patina of ancient bronze represents a major artistic theme of the Qianlong reign. Like his predecessors, the Qianlong emperor was a great admirer and collector of antiques, personally adding more items to the imperial collections than any of his forebears. Following in the footsteps of the Northern Song Emperor Huizong, Qianlong commissioned illustrated catalogues of specific areas of his collection. The emperor's interest in antiques was not confined to collecting, he also specifically commissioned contemporary works of art in ancient style. In the case of the current vase, this antiquarian interest was combined with another popular fascination - that of imitating one material in another. Lacquer, stone, wood and bronze were among the media reproduced in porcelain. Compare with other vases made in imitation of archaic bronze: a smaller Qianlong vase illustrated by R. Krahl, Chinese Ceramics from the Meiyintang Collection, vol. 2, London, 1994, no. 953; a green-glazed and gilt example in the Palace Museum, Beijing, illustrated in Kangxi Yongzheng Qianlong, Hong Kong, 1989, p. 394, no. 75; two vases illustrated by Qian Zhenzong, Qingdai ciqi shangjian, Hong Kong, 1994, no. 152 for a fanghu with a blue-green "patina" and gilding on the relief decoration, and no. 153 for another brown-glazed hu; a gilt gu-shaped vase illustrated by J. Ayers, Chinese Ceramics in the Baur Collection, vol. 2, pl. 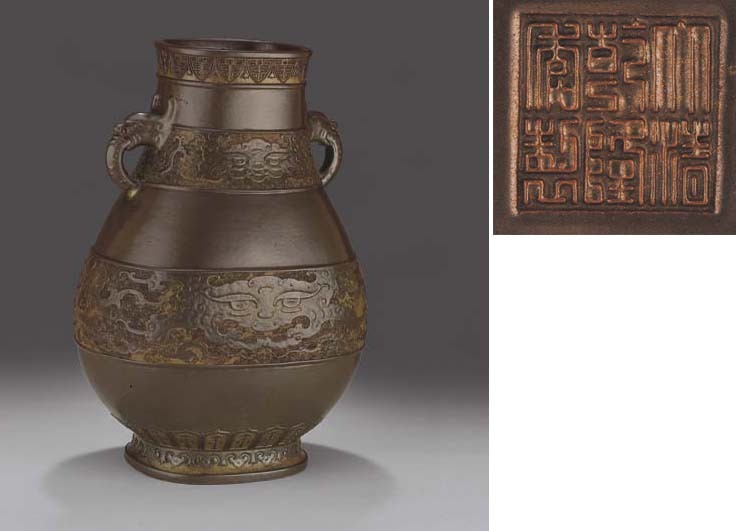 252; and a Jiaqing-marked jar imitating inlaid bronze, ibid., pl. 253.